‘Welcome’ emails - messages that are triggered by an event like a prospect signing up to your mailing list - present brands with a fantastic opportunity to immediately engage with customers and potential customers while they’re still a warm lead. Given that welcome messages often boast open rates far higher than your average marketing email, it can be tempting to cram as much information and as many calls to action into them as you possibly can. Take heed, however: first impressions are everything, and there’s a fine line between engaging new subscribers and scaring them off with information overload. 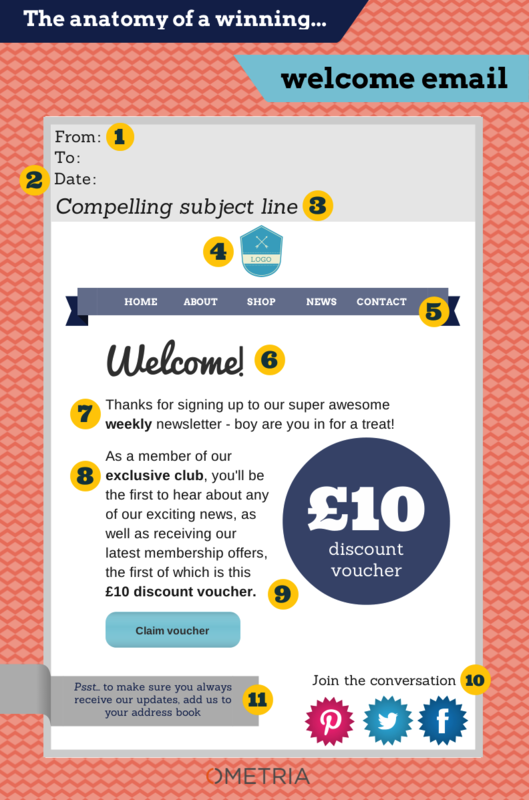 Here are the vital components of a winning welcome email (see below for a description of each). 1) Make it clear who the email is from without your customers having to open it first. After all, these guys have actively said they want you to contact them, and will be looking out for your emails - playing the ‘mysterious’ card when it comes to sender names and subject lines isn’t the best tactic in this instance. 2) Make sure that your welcome email arrives in a subscriber’s inbox within seconds of them signing up. Strike while the iron’s hot - if your first contact with a new subscriber is two days after they’ve signed up to your mailing list, the chances are they’ll have moved on to other things. There are a whole host of marketing automation tools out there that enable users to set up auto-responders that will fire out emails like this without you having to raise a finger - be sure to make use of them. Ensure that you follow subject line best practice when you’re crafting your welcome email; if you don’t you’ll likely earn, at best, the cold shoulder from your recipients or, at worst, a good old dunking in the spam bin. Coming up with great subject lines is a blog post in itself, but here are some pointers from the good folk over at MailChimp. People like consistency. If your website looks like it belongs in a flat party in Dalston but your welcome email looks like it’d be more at home in a Victorian tea parlour, your subscribers will probably start to think that something’s amiss. Make sure that your email marketing matches up with every other element of your brand - both online and offline. If you want to lure people back onto your online shop, try replicating your website’s navigation within your initial email. Hopefully they’ll be so dazzled by the content of your welcome message (particularly if it includes some sort of offer or deal - more on that below) that they want to get back onto your site for a second helping. It is a welcome email, after all. An introduction email is a great platform for setting expectations about what you’re going to be sending out to subscribers, and how often you’ll be doing it (basically providing them with reassurance that you’re not going to spam them to high heaven). Using language that engenders a sense of community and exclusivity, like ‘limited’, ‘chosen few’ and ‘members only’ will appeal to everyone’s playground longing to be part of the team. People like to think they’re gaining something when they give away their precious contact details. Welcoming subscribers with a gift - such as a discount code - will not only make them feel rewarded, but will (hopefully) get them back onto your website as soon as possible, ready to spend some money. Everyone likes to get new fans and followers, right? And while the number of times you can email subscribers each week is fairly limited, getting them to follow your social media accounts adds an important touch point to your marketing efforts. Email service providers are increasingly clamping down on spam, to the point that even some of the most well-meaning and greatly-anticipated emails can meet a sorry fate at the hands of a spam filter. To ensure that this doesn’t happen to your emails, it’s worth telling new sign-ups to add you to their address books.